Man City and Barcelona could reportedly be set to clash on the transfer market as they are both seemingly eyeing a move for Luka Jovic. The 21-year-old has been in fine form this season, scoring 25 goals and providing seven assists in 39 appearances for Eintracht Frankfurt during his loan spell from Benfica. As noted by the Guardian last month, Barcelona have been tipped to launch a €50m bid for the Serbian forward once he completes a permanent move to the Bundesliga outfit this summer, although it’s added that they value him closer to €70m. In turn, it remains to be seen if the Catalan giants are willing to negotiate and reach an agreement to bolster their attacking options, with coach Ernesto Valverde certainly in need of doing so given he has little quality and depth beyond stalwart Luis Suarez in the current squad. However, their touted pursuit of Jovic could have just become more complicated as The Sun report that City chief Txiki Begiristain was at Frankfurt’s clash with Benfica in the Europa League on Thursday night and was specifically in attendance to keep a close eye on Jovic. He didn’t disappoint as he bagged a goal in the 4-2 defeat to the Portuguese giants, and so the City director will arguably have left the game with a positive impression of the youngster. 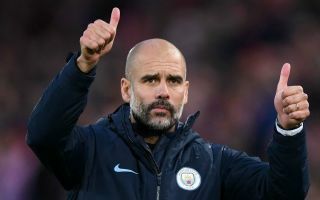 Time will tell if it’s enough to challenge Barcelona for his signature, but given that Pep Guardiola is lacking firepower up front too, it would seem like a sensible signing. Although the Spaniard has Sergio Aguero and Gabriel Jesus at his disposal already, an injury to the former has raised concern at a crucial stage of the campaign. Aguero has scored 29 goals this season, while he will turn 31 this summer. With that in mind, it might not be such a bad idea for Man City to start considering their options to add quality depth in the short term and a replacement in the longer term.